The New York Post Was Tasteless. That's the Point. Was the New York Post wrong to print on its Tuesday cover a photo of Ki Suk Han, struggling to lift himself onto a subway platform moments before a Queens-bound Q train struck and killed him? The question preoccupied the media Tuesday, and most journalists didn't treat the Post's choice too kindly. "A remarkable photo, but too gruesome for A1," wrote The Huffington Post's Ethan Klapper. (Never mind that the Post, with its tabloid format, doesn't have an A1 because it doesn't have sections.) "Sickening rubber-necking," was how Guardian Sports editor Ian Prior described it. "Imagine how this man's family feels." And some commenters were as disgusted with the photographer as they were with the paper, wondering why he did not attempt to save Han's life. A useful litmus test in cases like this is to ask what difference it would have made. The critics who would withdraw their complaints if they knew that the family had sanctioned the use of the image, or that the photographer he could not have intervened, are right to ask those questions. But for now, they're objecting on assumptions without knowing the underlying facts. (The Post isn't helping by stonewalling reporters on these points.) The rest of these critics are just grossed out, and are making an argument about taste with artificial moral flavoring baked in. The taste argument happens to be the better one. It is just an unpleasant, nasty picture. 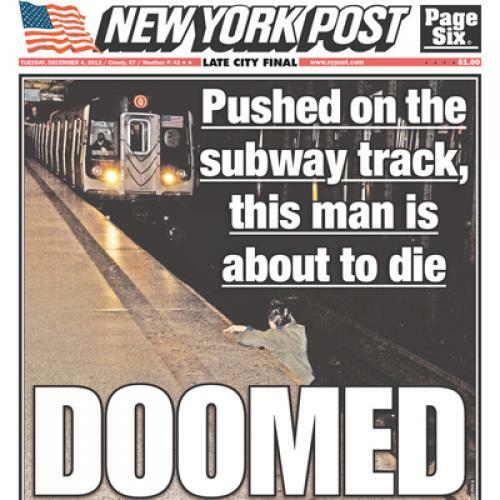 And the text around the picture -- "DOOMED" -- makes it even coarser. So let's call this front page what it is: tasteless. That's a judgment that's bigger than just this picture: What kind of newspaper would traffic in the cruelty of this man's circumstances? Well, the Post. It's a tabloid, with a classic tabloid sensibility. It knows what you want to talk about, or at least what enough readers to keep it going want to talk about. Everything else is academic silliness. It's fine to hate the conversations the Post chooses to foster and insert itself into, but it's a tougher thing to tell it, or any newspaper, that it ought to be better than the people who read it. In the tabloid universe, if you have a camera out just as big news is happening, you snap the picture and then immediately show up at the photo desk and try to sell what you've got. Once the paper buys the picture, and it's in the editors' room, the editors have to have some pretty serious arguments for not publishing something that actually depicts the life-or-death moment that every New Yorker has imagined, that some have survived, and that everyone is talking about this morning. Arguments like: it will compromise national security; it exposes a source; it was taken illegally. After September 11, there were similar arguments that people who leapt to their deaths from the World Trade Center were protected by a form of privacy; or that readers ought to be protected from such images (which many of us actually witnessed with our own eyes). In hindsight most of us know, or think we know, the response to that argument. These events happened, and they were news, and it would have been no more legitimate to suppress photos documenting the events as it would have been to spike the written accounts of them. This picture on the Post is not a pleasant sight. The man about to be killed looks all alone as the train bears down on him, prompting the viewer not only to shudder in horror, but to wonder why no one on the platform did more to help. That conversation continues to play out on the internet, particularly as it pertains to that photographer who took the picture. I won't get into that here—I just don't know enough about the circumstances to be able to come to a useful judgment about it. Either way, the Post's management will soon know exactly how many people bought that paper. And they will know how many more or fewer bought it than the Daily News, which, sitting right next to it on the newstand, published an old story about Kate and Will's managing to conceive a child and a report on A-Rod's hip. The sick public will have spoken, and the people who criticized the Post will know how much better they are than the ones who bought it. Tom McGeveran is the co-founder and co-editor of Capital New York.